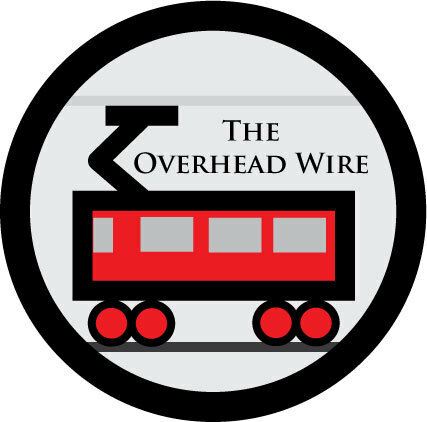 The Overhead Wire: Trains Vs Trucks? I think this is a perfect example of single mode network thinking. Yes the rail lines don't go to the back of the Best Buy but they shouldn't. The rail lines do certain jobs well and trucks do other jobs well. Why not work together? In transit, my favorite example is the CityCargo tram. Yes it's a tram that delivers cargo, but it has little electric trucks to deliver directly to the door to merchants in Amsterdam. It only works with both modes. Once upon a time various businesses were built along the railroad line, and each had their own siding. clearly trucks are starting to feel threatened by rail's renaissance. and of course lately the freight railroads have been driving home how much more efficient railroads are over trucks. 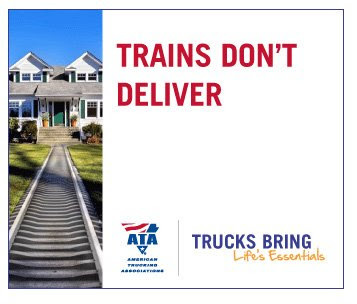 Um I love how they make this ad, yet many long-distance trucking firms are relying on intermodal ability to use railroads for the long-haul. Actually, a freight rail slip into the back of the average strip mall would be perfect. "What's also interesting is that freight trains are what's keeping passenger trains from becoming modernized in this country (not to say they shouldn't exist, of course they should!)" Actually, you ought to find a copy of industry rag Railway Age. You'll find that's not the case. In the latest issue, Matt Rose, CEO of the second largest railway in North America outspokenly stood up for rail passenger and transit systems and criticized the FTA's "anti-rail" bias. That's right. Freight railroaders standing up for transit. The world is changing. I don't know what it is, but more and more I'm coming across binary thinking. Something is either 100% right or it's 100% wrong. There's no in-between. I want to say it comes mainly from the right-wing fundamentalist segment (that's where I first noticed it) but I see it with liberals too. According to this ad we should build bridges over the oceans since ships can't get to a supermarket in Denver? Didn't a recently in charge American claim "Either your with us or you're against us"? i think we are going to start hearing more pro-rail talk from the democrats. the republicans are getting caught on the wrong side of the tracks on this HSR issue and fail to see that it is something that the american public wants and supports. they think it can be a posterchild for waste but are too out of touch and blinded by old ideology, to see that HSR is just the thing people want to see money spent on. ABC: that would be BNSF, right? BNSF has a positive record on supporting passenger rail. It's UPRR that's really obstinate and that screws with Amtrak. Kenf: well, there is the High Line in New York... but I think that was atypical from the start. And in NY they also used to put freight cars on barges in NJ, and move them to all parts of the harbor that way. And Baltimore and Boston used to move freight cars on tracks down the middle of the street. I've heard tales about drunks swearing to go on the wagon after seeing a locomotive running down the middle of Pratt St in Baltimore. the cargotram is unfortunately bankrupt. A great idea, but businesses are not ready for it. The truck industry has always had a winner takes all mentality, which probably comes from the attitude of companies like GM in the 50s. What is probably more scary is the possibility of large scale truck driver losses in intercity transport as carriers steadily improve their dispatch to take advantage of the lower driver costs of freight trains. The solution, of course, is trains plus pushcarts. I LOVED that book Cap'n! If you pick up a copy of "The Electric Interurban Railways In America," you will note that less-than-a-carload freight traffics was a major contributor to the profitability of privately operated interurbans. Heh in the freight chapter, it states: "Prior to the enacting of the two cent fare laws of 06-08, the differential between steam and electric passenger fares was enough so that the interurbans could charge a fee,usually 25 cents, for each bag." Predecessor to the airlines! CN (Canadian National Railway, actually privatized by the Chrétien Liberals in 1995) does intermodal shipments; I saw this on trailers from trucks near the 401 (the main highway through Southern Ontario) in Mississauga, west of Toronto. This "winner takes all mentality" is bad enough. The advertising is propaganda. Railroads offer 3X the efficiency of trucks. Must I say more? Totally agree with you would also cut down on fuel emission and help the environment.